1) Before knowing the effect of 11th house lord in 6th house we have to know about Eleventh House and Sixth House. As 11th house lord is just placed 8th from own house so you may read First House Lord In 8th House. General meaning of this shlok is when 11th house lord is placed in 6th house native will be suffering from disease. Native may be cruel minded and lives in foreign place . Native may also suffering due to his enemy. When 11th house lord placed in 6th house, native has many enemies. He may be sick for long time. He may be clever and expert in accumulation. He may be found death in the hand of thief. 3) 11th house lord in 6th house is just 8th from own house so it’s creating 8th-6th relationship which is not consider good regarding relationship. But both 6th and 11th is upachay house so placement of 11th house lord in 6th house is indicating improvement of both houses. Apart from this 11th house is bhavam bhavat house for 6th house so it’s placement in 6th house gives natural strength to 6th house. So the results may be fully depending on condition of 11th house lord in 6th house. If placement is good regarding planet and sign significant or other significant then it’s give good results other wise it will give bad results. 4)6th house is belongs to legal matters so if 11th house lord in 6th house is well placed then native may earns through legal sources such as lawyer, working in court etc . If not well placed then native may suffering from legal problems and may lose his wealth due to such type of matter. Native may facing legal problems through his elder brother. 5) 6th house is belong to logic, quarrel, fighting so if 11th house lord is placed in 6th house and in good condition then native is very logical, no one can win over him in logic. Native may be a natural fighter. But if not well placed then native may be quarrelsome and Inclination towards quarrel without any region. 6) 6th house belong to service so 11th house lord in 6th house is indicating native may has inclination towards service. If well placed then native may gets a good service and elders or higher post officers respect to him. But if not well placed then native may be working under others person and doesn’t get good success. His officers always creating trouble for him. 11th house lord in 6th house is indicating native may has natural inclination towards service in place of own business. Native may has not enough strength to do own business or taking risks. It’s may also indicating native doesn’t have leadership qualities but native may be a respectable person. Native may always facing financial up and down in his life. 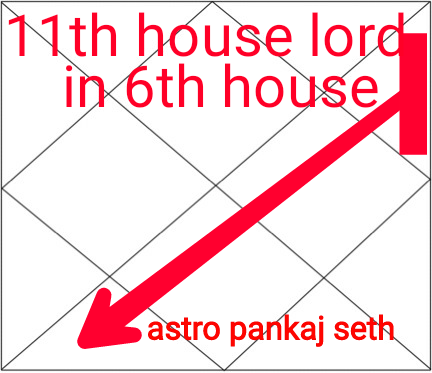 7) 6th house belong to debts and 11th house belong to profit or gain so 11th house lord in 6th house is indicating native may be getting profits through debts. So if 11th house lord is well placed in 6th house native may gets easy loan. Native may be rise or gets success through debits. But if not well placed then native loss his profits due to debits. Native may be suffering from legal problems due to his debts. It may also indicating native may earn through business of debits or to give money on interest. Native may be working in banks or such type of loan giving agency. 8) 6th house belong to enemy so 11th house lord in 6th house is indicating native may have many enemies. If well placed then native may crushing his enemy and if not well placed then enemy crushing him badly. 9) 6th house belong to disease so 11th house lord in 6th house is indicating native may be suffering due to disease. If well placed then native may be earn through medical line such as hospital, nursing home, as a doctor or service under medical field. If not well placed then native may facing financial losses of money due to disease. As 11th house belong to legs so it may possible disease related to legs. It may also cause ears related disease. Native may be suffering from mental stress. 10) 11th house belong to gain and 6th house belong to immoral matters so 11th house lord in 6th house is indicating native may be earn through immoral ways. Native may be fully materialistic regarding money matters. Apart from this 11th house also belong to desires so 11th house lord in 6th house is indicating native may has immoral desires. 11) 11th house lord in 6th house is indicating native may has enmity from his elder brother. It’s also not good regarding elder brother. Native may use his elder brother for profit making or financial gain. 12) 6th house belong to Mamaji so 11th house lord in 6th house is indicating native may gain through maternal relationship. If not well placed then native doesn’t has good relationship with his maternal family. 13) If 6th house lord with 11th house lord in 6th house and well placed then native may be a successful lawyer. Native may be a good doctor or bank officer or in reputed loan agency. If not well placed then native may be suffering from enemy, debts, disease. 14) If you want to know about the effect of different Planet in 6th house then click on this link.